Combine These Putting Practice Games Along with Focused Dedication... for Great Improvement in Your Golf Game! These Putting Practice Games and Drills that we have developed are designed specifically to simulate actual playing conditions, while dramatically improving your putting! The Games are also designed to make putting practice much more fun! The goal is to alleviate the problem of playing poorly on the course due to stress and tension, as well as eliminating 3 and 4 putts! It is strongly suggested to perform these putting games and putting drills with a partner with whom you are playing golf on a regular basis. These golf practice games have proven to be much better with a Partner, and are more interesting and competitive! We have developed numerous putting games and drills for putting practice, but we will only be presenting one of these in this article. Following is a detailed explanation of the game including a specific diagram showing the basic setup, and a score card for keeping score. We also will present a sample of a linear graph (Excel Chart) which we use to track our progress in this particular game. Note: All putting practice games are designed to be played on your local golf course practice putting green. The chart below delineates the Scoring and Rating for this game. You may find that the first time you play this Putting Practice Game, you might have difficulties in reaching a positive number in your scoring! But don't be dismayed, regular practice will show dividends. First: Both partners need to agree on a location pattern for the nine-hole flag placement. This placement should be different each time you practice this game, so you will have to read the Putting Green a different way each time you play the game. Each partner should warm up by putting through the nine-hole setup one time, with one ball. Placing wagers on the game will create tension and stress as if you were playing for real. You can play for: loser buys lunch, 50 cents per hole, Three dollars per game etc. Do your best to hole all putts, but hit them firm enough to go past the hole about 12-16” if you miss. “Uphill, Level or Downhill” and “Break left, Straight, or Break right" and the associated amount of break; such as two balls left, 18 inches right etc. This promotes a habit of “Reading-The-Green”. Reading-The-Green: "Downhill, break left 8-10 inches"
Calling Out the Score: "plus 15, plus 5"
Partners to alternate putting first at each Hole. (Flip a coin to see who goes first). 1. In this game, each partner will use (1) white ball and (4) yellow (colored) balls. The white ball will be the first hit, and it will be the most important. Consider the white ball mentally as the only ball you are putting --- just like out on the Golf Course where it really counts! Utilize your "Pre-Shot Routine" for the white ball at each hole. Be sure to use a white ball with a line-up arrow or mark on the ball. The object of putting the (4) additional yellow balls is to sharpen the skills necessary to repeat a golf putting stroke with consistency on the same target line at the same speed or pace. 3. The first putting Partner will now putt the white ball towards the Hole. Determine from putting the white ball how firm a stroke is required, and how much to allow for the break if there is one, and what the true target line will be. 4. While maintaining your original stance, take your putter and pull (1) yellow ball into position, adjust your stance if necessary, then stroke that ball based upon what you learned by putting the white ball. If you leave a ball short of the hole, you must not remove it even though it is in the way of subsequent putts. (That is your “penalty” for leaving it short!) Never Up – Never In! 5. After you have putted all five balls to the hole, determine your score for that hole based upon the scoring system as outlined below. You must then call out your score to your partner, then pick up all (5) putted balls. 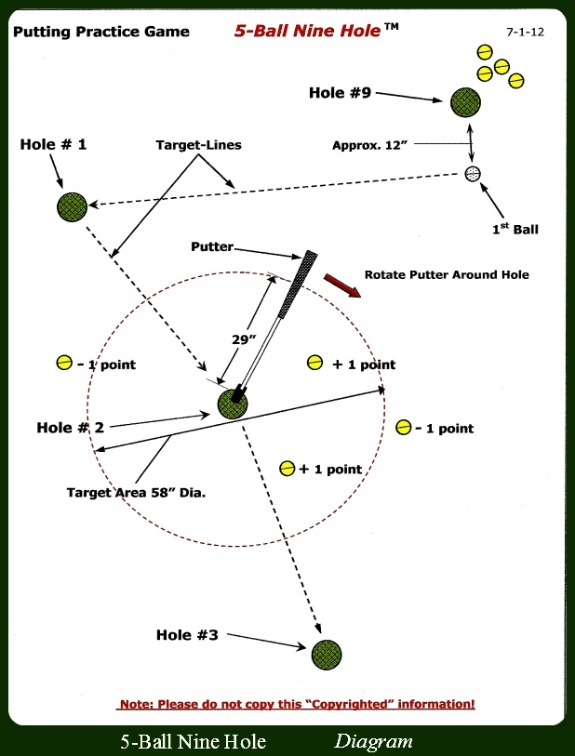 As shown in the diagram below, hook your golf putter head in the Hole and rotate around to determine the score for each ball outside the Hole. 6. Continue this process with Partners alternating playing first at each hole. After putting the final yellow ball to Hole #9, you are finished with the “Round”. 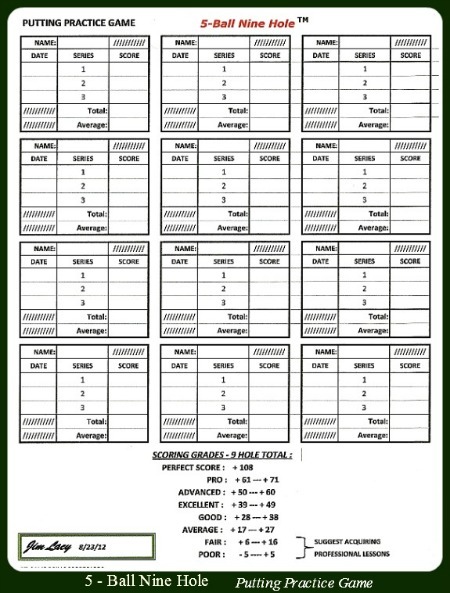 The Partner finishing the round first, will then enter the scores on the prepared scorecard (as shown below) for each partner. We strongly suggest starting with the Large "Target" area until you can average above 50 points on a regular basis, before graduating to the next size down! This Putting Practice Game is fun! After entering scores for three “Rounds”, average the three 9-hole “Round” scores then enter that final score on the “Score Card”. Create charts of the scoring periodically. We have used Microsoft Excel Charting for this purpose. Note: The three rounds of this "Putting Practice Game" can all be played in one practice session, or at separate times. Including flag setup and warm up with one ball, the drill should take approximately 45 minutes to complete one 9-hole “Round” with two players, or approximately 20 minutes for one player. We have developed many Practice Games and Drills for all areas of the golf game. We will be publishing these as E-books with a book for each category: Putting, Chipping, Pitching, Bunker Play, Driving Range etc. We hope this article on Putting Practice Games and Drills has been interesting for you. But most of all we want to see you improve your Golf Putting Game! Let us know if the game works for you, and if there is anything we can do to make it better. Putting Drills can be fun!